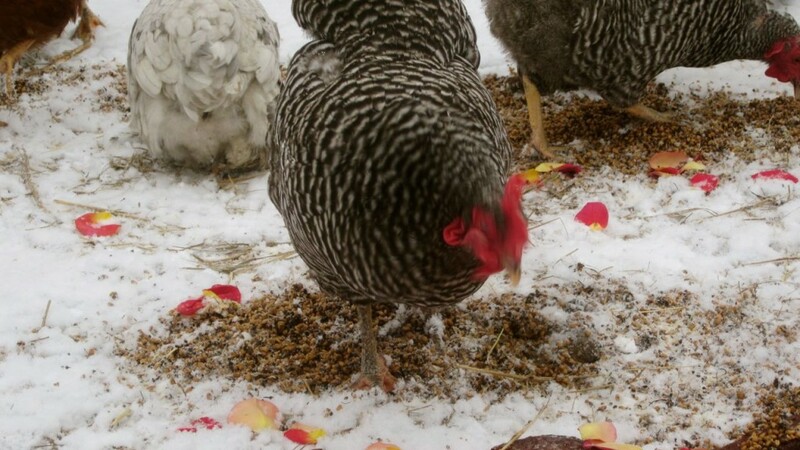 Sprouting grains for chickens: has it come to this? By all accounts, our musical melodrama, The Fireman’s Flame, that we put on this weekend was a big success. Once again God blessed our efforts: proof that a couple of bumbling well-meaning parents with no training for producing theatre, but plenty of passion and fairly strong backs and a talented group of thesbians, can put on a good show. 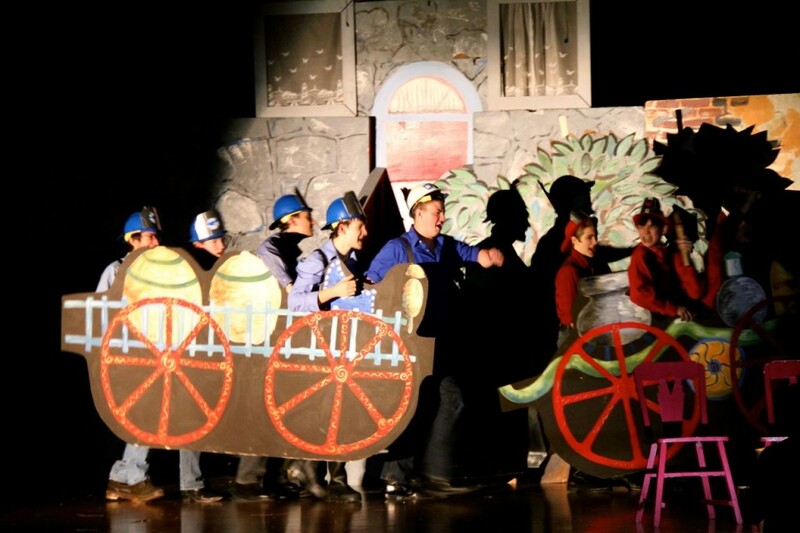 We had two big enthusiastic audiences; the kids performed with passion and high energy; all the tricky backstage tech stuff worked out after all; the audience left grinning and chuckling; the families of the actors and crew left exhausted but happy, too. In the middle of an intermission the second night, I slipped out of the Green Room (where I was hanging out with my energetic thespians) to dash to the bathroom across the hall. I looked one way and saw a couple of drama parents running the Silent Auction, with people carefully considering and jotting down their bids. I looked the other way and saw several drama mamas selling concessions. These sweet ladies are volunteers who serve in order that our drama bills will get paid. “Geez,” thought I, “what an excellent team I’ve got. I am so blessed!” And so I was. And am. Not to mention supremely grateful. Of course our melodrama had a big chase scene, this one involving the two teams of firefighters, carrying their apparatuses. I’ll write another post about The Fireman’s Flame later this week, when I’ve had a chance to upload all my photos and give it some more thought. But today, I’m writing about chickens. Feeding chickens, to be more particular. Feeding sprouted grains to chickens, to be precise. So why, you may be asking (and well that you should, Gentle Reader) am I prefacing a post on feeding sprouted grains to chickens, with anecdotes about your weekend melodrama? 5 minutes. Ha. I gritted my teeth and prayed for patience. 5 minutes. Bryan was trying to do me a favor, but I knew that I actually needed several hours to make the house presentable for company. We had been spending every available moment at that time on building and painting set, practicing musical numbers, sewing Amalia’s costume, and whatnot. I knew how cluttered and dusty and just plain dirty the house was. I knew that we’d left the kitchen in a mess, with the sink full of supper dishes and a bucket of dirty eggs on the counter. Oiy. My pride was certainly going to take a hit. I braced myself. Now please don’t make the assumption that I am a perfectionist where the appearance of my house is concerned, because I’m certainly not that. I just knew that the house had crossed the line from “comfortably lived-in” to “downright disgusting.” It had gotten so bad that I was a bit embarrassed when the dogs came in the house. “Sorry, Ollie, the house is a bit messy right now . . . oh don’t go into that room, Bea . . . ” And I had 35 people coming to my house in less than 5 minutes. Timothy had hurried home before us, and was busily making a fire in the wood stove on our sun porch, the only room big enough to hold 35 people, and where we’d hold our rehearsal. In his resourceful way, he was hauling furniture out the window to the backyard, so we’d have enough space for a rehearsal of sorts. And the two freakishly broad cow-horse creatures that we’d made out of chicken wire and paper mache were going out, too. Timothy is a problem solver, and he doesn’t waste time at it, either. I admire this about my son: he doesn’t moan and complain about the sorry state of affairs, he just puts his head down and figures out a way through it. I could learn a thing or two from him. Sigh. I dashed into the living room and folded up a couple of blankets and loaded some wood on the fire in the living room stove, and tossed an armful of clutter into our bedroom, closed the door firmly, and hurried into the kitchen to do what I could to tidy it up a bit. I had, perhaps, at this time, 2 minutes left. I glanced out the window and saw the caravan of car lights coming down our driveway. It looked like my 5 minutes was already up. The kids were either blessedly oblivious (far as I could tell) or blessedly gracious to the mess that surrounded them, giddy as they always are to be together and rehearse. At one point in the evening, I went into the main bathroom, to see . . . several buckets of grain sprouting for my chickens. I quickly swept up a few grains that had spilled out of one of the buckets, and casually draped a bath towel over the buckets. Maybe nobody had been in the bathroom yet? A couple of the buckets had been there for several days, and were beginning to smell a bit fermented. At that moment I realized that I had crossed the line from casual chicken fancier to crazy chicken lady. 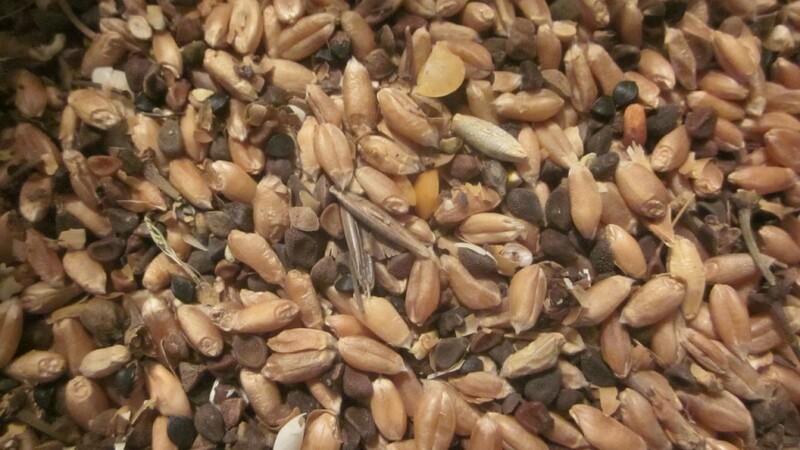 Here are the grains I buy, a mixture of weed seeds, barley, wheat, and whatnot, BEFORE sprouting. Dry and hard. So I started doing things that were just a bit harder, but apparently are much better for my chickens. First, I found a source of organic mixed grains (they are “screenings” so they actually cost no more than the cracked corn, though we do have to drive an hour to pick them up) and then I started soaking them. Some people take it even further and grow fodder from their grains. I don’t do that. At least, I haven’t yet. And others ferment their grains. Sometimes my grains (like that night that all the drama kids were at my house) get away from me and they might get a bit fermented, but I’m happy (for now, anyway) with just soaking them for a day or two before I feed them to my chickens. Better nutrition: Did you know that if you let grains sprout, the protein content can jump by 50%, depending on the grain and other factors? Apparently this is true. More grain for your money: the volume of the grains, as they swell up with water and sprout, increases. A half-bucket of dry grains becomes a three-quarters-full bucket of grains, just with the addition of warm water and time. I like the economy of that. One more thing: Did I say three things? I meant four. Sprouting neutralizes phytic acid, which blocks the absorption of many minerals, and it also increases the vitamin content. Here’s a cool fact: sprouted wheat contains four times the amount of niacin and nearly twice the amount of vitamin B6 and folate as unsprouted wheat. Here are the same grains, after a couple days in the sprouting bucket: swollen, fat, and sprouting! They look tasty even to me! Okay now, perhaps you’re thinking of crossing the line to becoming a crazy chicken person, too, and soaking some grains for your chickens. How to do it? I have tried several different methods, and finally landed on the one that I like: I’ll coin it the pillowcase-bucket method. My friend Anne (of the Back to Eden garden fame) suggested a variation of this method to me, so I knew it would work. After some experimenting and tweaking, I came up with a method that works well for me. Maybe it’ll work for you, too? First: I fill a clean white cotton pillowcase with the amount of grains I will need for a day (for my flock, that’s about half of a 5-gallon bucketful), twist the top closed, and place in a bucket with plenty of holes drilled in the bottom. This bucket I slide inside a non-holed bucket. Then I fill the top bucket with enough warm water to cover the grains and add the lid. I check it after a few hours and add more water, if necessary, to cover the grains. The grains swell quite a lot. Second: After 24 hours, I pull the pillowcase out of the bucket, dump the water out of the buckets, and then replace the pillowcase into the holey bucket (slipped again into the intact bucket) to drain. I let the grains (still in the pillowcase) drain for another 24 hours. Voila! After the second day, the grains have sprouted and are ready to feed to my hungry chickens. And they clean up every last sprout and grain, let me tell you! 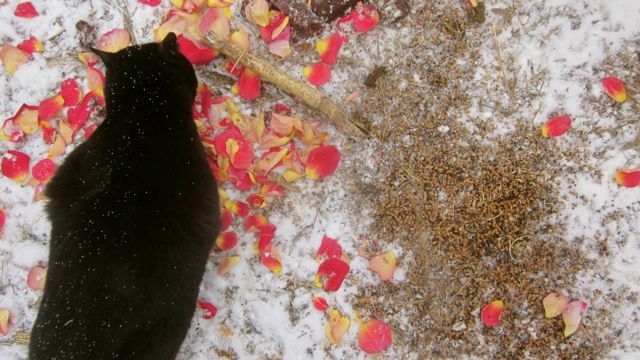 The “chicken trash” from the kitchen on this day included some spent Valentine’s Day flower petals. I had to take pictures of them. They were the prettiest roses ever. I carry the bucket out to the chicken yard, and dump a trail of sprouted grains through the yard, including on top of the deep mulch that I’ve piled there for my flock. The chickens will scratch and eat those grains all day long. I also dump any kitchen trash (vegetable peelings, leftover crusts, expired veg, etc.) and they love it all. Our opportunistic cat, Tristan, always insists on first dibs. So if you want to try this for yourself, this is all you need: (I have a flock of about 50, so if you have less you can certainly scale this down, and use smaller buckets or even quart or two-quart jars). grains that have not been put through a dryer (always ask): heated grains won’t sprout! That’s it! Ohh, if you do this for your chickens, they are going to be so happy . . . .
HEY, if you found any value from this post, could you share it, pretty-please?? You have some very lucky chickens – and family. Admire your dedication and willingness to go above and beyond. HOW do you find time to blog???? Well done. I used to sprout seeds for my family to eat in the 70s. The children grew up strong and healthy, so I can attest to the goodness of the seeds. 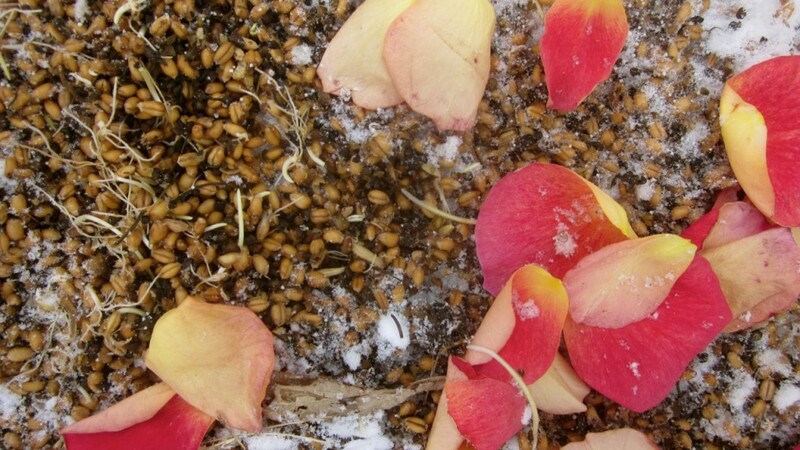 I love your method of sprouting a large quantity of seeds for your chickens. No nonsense but very effective. I’m so glad your play went well and gave you satisfaction after all your hard work. Lol! But all that feeding was worth it. The chickens are a beaut! Wow, I had no idea of the love that you put into the chickens, and they sure do deserve it! Dedication and hard work making sure your hens are healthy! Thanks for sharing! Oh well, Nate, I do love these chickens of mine! I believe that I have always considered you to be a Crazy chicken Lady. Adding sprouted grains didn’t tip the scale, it just reinforced what I and others already knew. I do like the non GMO food so I think I will try making some sprouted grains for the 7 baby chicks we have here in Mexico. I do enjoy watching them grew. And they do not have a chicken coop. they live under a tree in a protected area of the yard. Truly free range. Chef William, I’ll take that as a compliment . . . I think . . .! . . What will you do with the chickens when you head back to the states? They’ll only be half grown by then, won’t they? Great idea! And dont worry about your house – we have the lived in comfortable look… and then some weeks… the dishes pile up in the sink, and counter. Spilled birdseed spills on the floor on my way out to the bird feeders and it stays there. Piles of clean clothes accumulate because we forget to put them away, etc. Well . . . Diane . . . but at least those are piles of CLEAN clothes . . . 😉 But we’re catching up this week! 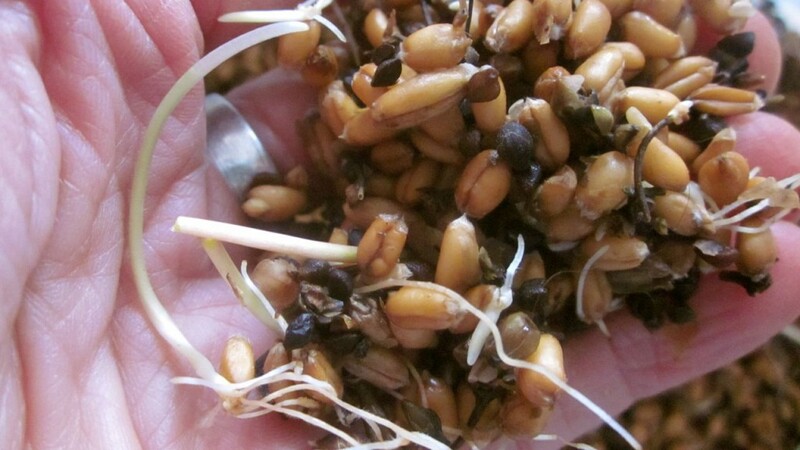 I never even thought of sprouting grain when I owned chickens too many years ago, but it does make sense. And I second Carolina Heartstrings – how do you find time to do everything? We want a book full of your secrets! I’m grateful I didn’t have to worry about GMO corn in those days. UGHH! Great post! Are all your chickens layers? 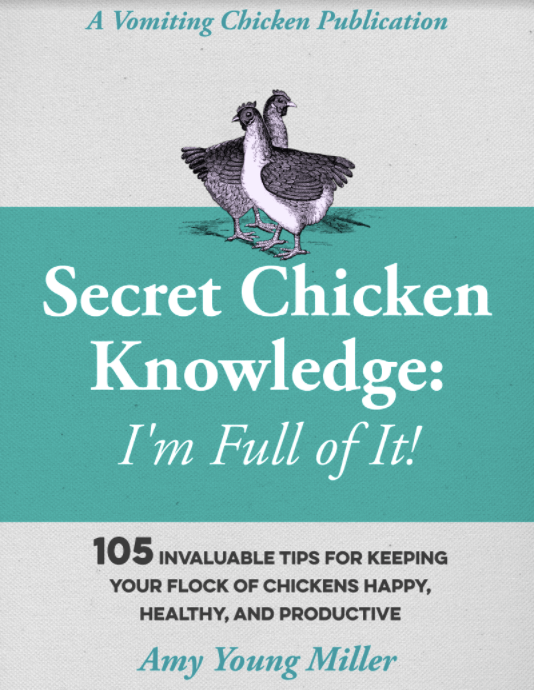 50 chickens … What is your ‘cycle’ of chickens? Do you raise your own chicks? How many birds do you raise for your family to eat? Would appreciate any advice! We are getting closer to moving out to the homestead and are discussing about how many chickens we’d like to plan for. With all the lumber from the dismantled corncrib, we would be able to build a good coop. Have you written a post about your coop? 3. You don’t want my coop. We built it lots of years ago and it’s too small, with several design flaws. In fact I might write a post about what coop NOT to build, and that would be ours. The one thing it has going for it would be the cement floor (covered by deep bedding) that my husband insisted on. Keeps the predators from digging in! Here’s what I would try to do: build it as big as you can afford, since you’re always going to want more chickens than you have. Do install a cement floor. Plan for at least two rooms, with a door to close in between them. You’ll always need that second room: for brooding chicks, for isolating a sick chicken, etc. Make sure your door(s) are easy for clean-out. I have a really unhandy bottle neck in my coop door design which makes it difficult to clean out the bedding. Good luck with your new homestead! Remember that you don’t have to do everything the first year. Take your time and do a little every year, so you don’t end up with more than you can take care of! (guilty of that!) Blessings on your endeavour! I try to make it that way, Sophie! I do love my chickens! 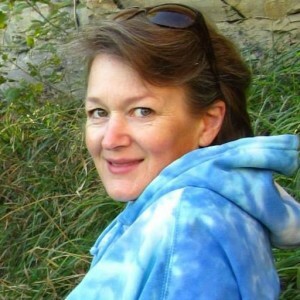 I’m sorry to comment on such an old post, but I’ve just stumbled onto your blog today. Do the sprouted grains replace the layer feed or just the cracked corn? I love ths content and writing of this post. I look forward to reading the rest! Holly, that’s a good question. 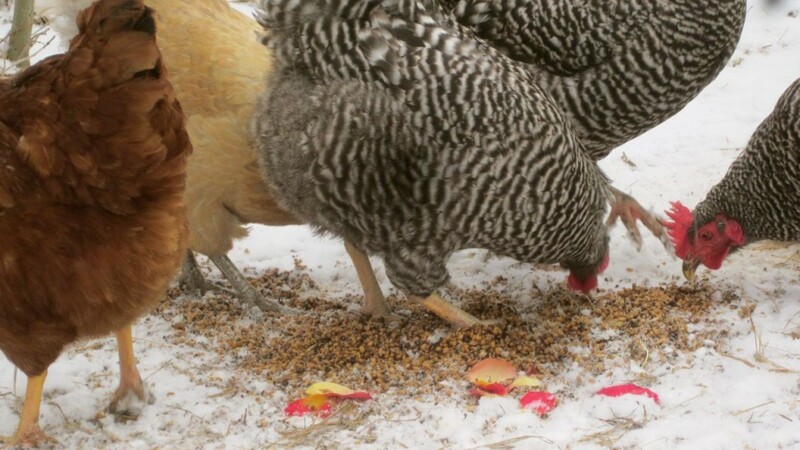 I actually feed a combination of layer feed and a bit of cracked corn in the feeders, and I toss the sprouted grains out on the ground. I’d say I feed about a half and half combination.